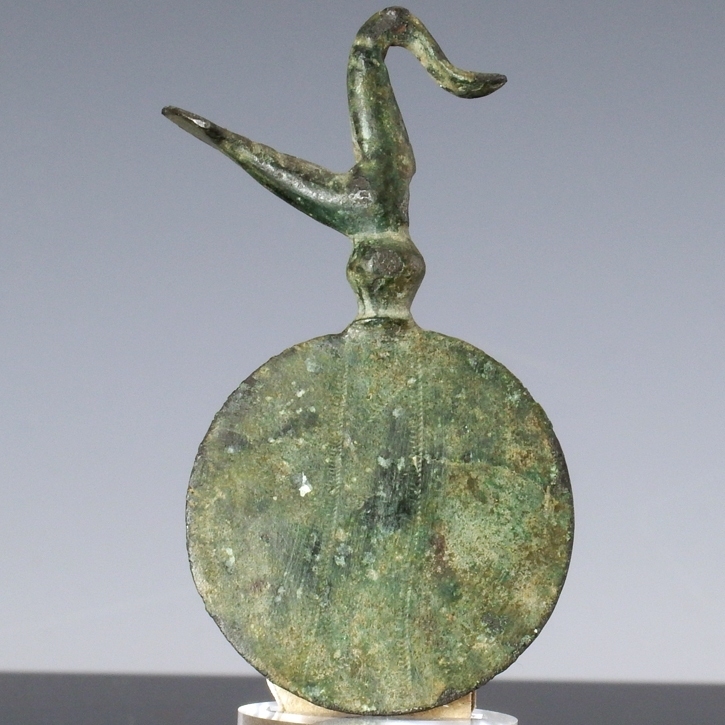 Pendant in the form of an S-shaped bird, perched on top of a disk. These water birds were a popular motif in Ancient Greek Geometric art. Incised lines embellish the base of the neck and tail of the bird, the disk is incised with punchmark lines on both sides. Provenance: old German collection (Hessian), acquired before WWII. Similar bronze birds atop disks have been found in both southern Greece and in Thessaly (northern Greece). The bird is pierced through its neck, indicating it was originally suspended, but its precise function is unclear. Small bronze birds, designed for suspension have been found in sanctuaries as offerings to the gods, but others have been found inside graves. Scholars suggested these offerings might have hung from the trees in outdoor shrines. Possibly they originally served as dress ornaments or pendants and were later dedicated to the gods. Other scholars argue that the figures served primarily as dedications to the gods in southern Greece, and as funerary objects in northern Greece.